Your could well be asking yourself, what are kilt occasions? Well just about any occasion where you think your kilt is suitable attire, and you choose to wear it. The first obvious one is a wedding, this is without doubt one of the most popular kilt occasions of all. I should know, I've done it myself, and it makes for a truly spectacular wedding theme. For those of you who don't want the expense of buying a full Highland Dress outfit, do what many people do, and go for a wedding kilt rental, then you can look a million dollars without spending to much. Just to emphasize that point, below you can see a photo kindly sent to me by Jim, who is a regular visitor and contributor to the website. You can see him in a rented kilt outfit at his daughter's wedding, which took place at the exotic location of Antigua, Guatemala, in 2007. Now taking this one step further, many people today are going all out and choosing Celtic weddings as the theme for their big day. Now attending a Highland games is another great opportunity to wear your kilt. These games take place all over Scotland, during the summer months, and you will see not only the competing athletes and dancers wearing kilts, but also many of the spectators not to mention the pipe bands. 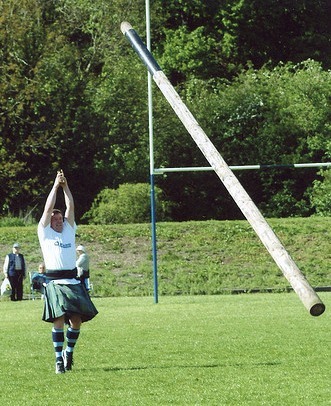 Below is a photo taken at Hawick Highland Games, the athlete, kilted of course, is competing in the tossing the caber competition. 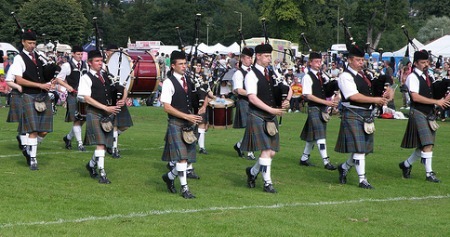 And here you can see the Stockbridge pipe band taking part in a Grade 2 Pipe Band Competition, at Perth Highland Games. And of course you don't have to go to Scotland to appreciate these spectacular Highland Games, as they take place in many parts of America, Canada, Australia, New Zealand, Europe and South Africa, to name just a few. The Edinburgh Millitary Tattoo is one of the very best kilt occasions. As one of Scotland's most famous visitor attractions, it features acts from all over the world, and is truly a world class extravaganza with massed pipe bands, Scottish dancing, martial arts displays and much much more. So if you happen to be in Scotland during August, I strongly recommend seeing this show, and wearing your kilt. As for Tartan Day, it is one of the major kilt occasions, where America and Canada celebrate the strong links between their countries and Scotland. It is a national holiday in America, and is celebrated on the sixth of April. Many different towns and cities across both America and Canada, celebrate with massed pipe bands and many forms of Scottish culture. Sean Connery is a big supporter of this event. and as a Scotsman wants to see the cultural links between North America and Scotland strengthened still further. Every year more and more students attending graduation ceremonies, are choosing to receive their degrees dressed in their kilts. On one of the most important days of their college or university career, they want to dress up in their finest clothes. And for many this could only mean wearing their kilts, as they wish to display their Celtic heritage. So for what other occasions is the kilt appropriate? Gala or formal dinners, Burns Suppers,Hogmanay (New Years Eve), sporting events (such as football or rugby matches) going to the pub for an evening. Attending church, there are countless occasions when you can wear your kilt. So much so that one man wrote to me to say that he loves to wear his kilt while riding his motorcycle, and why not? In fact I struggle to think of an occasion, either formal or casual where the kilt is not a suitable form of dress, it is simply that versatile. So when are you next going to wear your kilt?